Everything that comes in the box. The indoor mounts are the round bulbous ones, while the outdoor mounts have the screw. 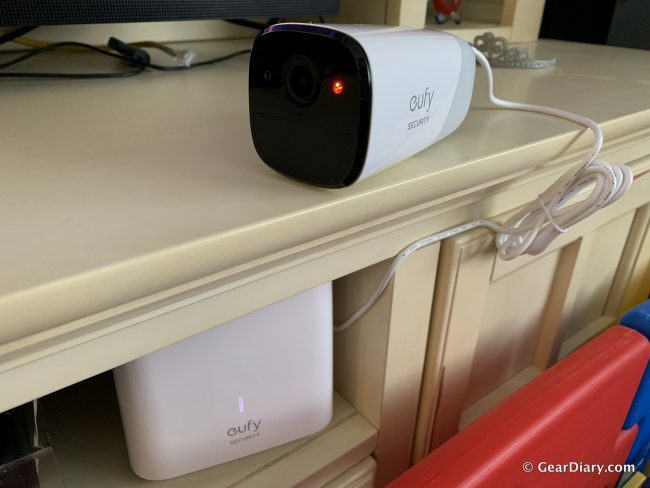 I was first introduced to the eufyCam system at parent company Anker’s NYC Anker on Board product launch event back in October 2018. I was instantly psyched about the idea of a totally wire-free security system with zero subscription fees. 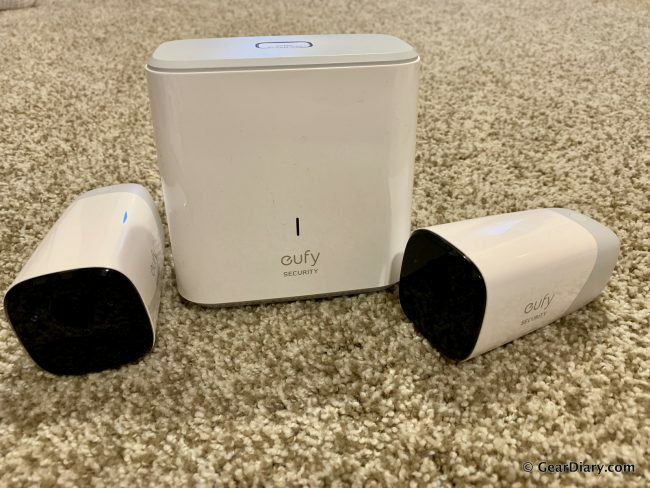 That night I spoke to our Anker press contact and expressed how excited I was about eufyCam and that we needed to review it as soon as it’s released. Lo and behold, Anker came through! The eufyCam system comes with two cameras, one base station, two different types of mounts, mounting hardware, and an Ethernet cable. The cameras have a 1080p resolution for crystal-clear quality and are IP67-rated weatherproof so they can be installed inside or outside. Each camera has excellent night vision, so you won’t have trouble keeping an eye on your house in the middle of the night. The indoor mounts are round and use strong magnets to keep the cameras in place. I wish I could use this mount outside, however, eufy advises against it. Using this mount, the cameras could be very easily be removed and adjusted. The outdoor mounts are not terribly difficult, however, they use a screw to connect to the camera. It’s not the end of the world since you only need to take them down once a year to charge, but it would have been nice to use the magnetic mount outside. The rear of the eufyCam, showing charge port and mounting screw. The magnetic indoor mounts align with the round concave area to form a strong hold. Eufy uses facial recognition technology and artificial intelligence in order to reduce the number of false alarms. Things like birds, dogs, and falling leaves aren’t supposed to set off the motion sensors, however, I’ve noticed that large things like cars or even deer will trigger the motion sensors. You’re able to add friends’ faces to the app so that the cameras recognize them and don’t alert you, however, this feature hasn’t worked for me yet. The rear of the base station, showing USB charging port, AC adapter port, ethernet port, and microUSB port. 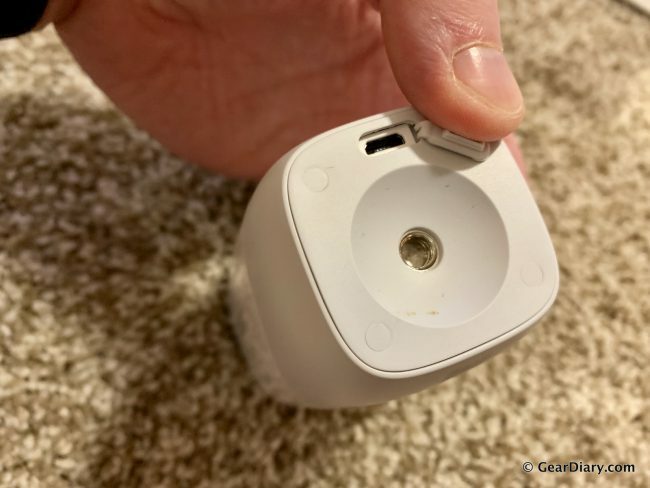 The hottest trend in home security right now is cameras from companies like Ring and Nest that require a monthly subscription to re-watch the videos that were captured by your camera because your videos are stored in the cloud and someone has to pay for that data storage. While there’s nothing inherently wrong with that, eufy has come up with a different solution that requires no recurring charges. The eufyCam fast charging using the base station (below). 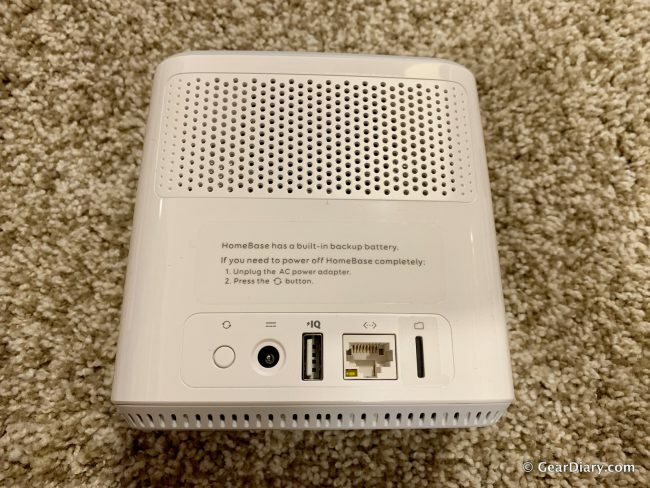 The eufyCam system comes with a base station that connects to your network via Ethernet and houses a 16GB microSD card for up to one year’s worth of video storage and the storage is expandable if you want to store more than that. The base station also serves as a fast charger, which will charge one of the cameras at a time in under 4 hours. I did test this the first time I charged the cameras and eufy was absolutely right, the camera charged in just around 4 hours while the camera that was charging using a regular speed charger was still not at 100%. 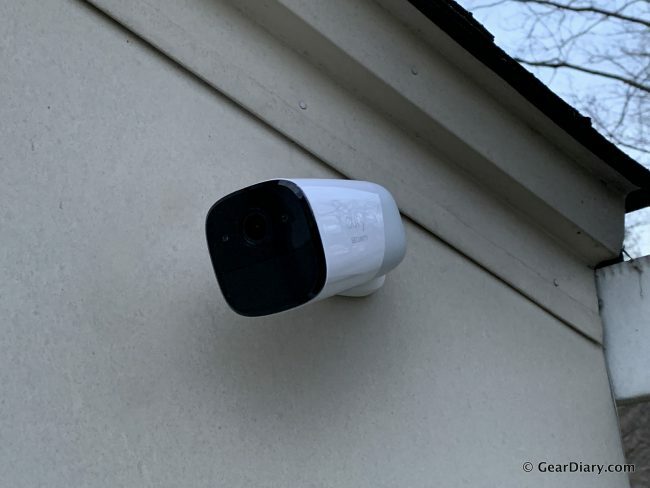 The eufyCam installed on the exterior of my house. The base station seamlessly integrates with the eufy Security app, giving you access to all of your recordings at your fingertips. You receive notifications when there is motion at one of your cameras and can instantly see what’s going on. Or, you can scroll through all of your recordings, sorted by date/time order or by camera. A nice feature of the app is that if it captures a face on camera, it’ll include a snapshot of the persons face so you can instantly see whether or not you recognize them and decide if you want to view what’s going on. Installation of the cameras was very easy, which is something DIY’ers always want to hear. The included outdoors mount uses two screws that help you attach the mount to any flat surface. Once the mount is connected to the house, tree, etc. you angle the camera however you want and screw tight. Installation of the two cameras took about 30 minutes total, and I’m not the handiest guy out there. The base station is fairly plug-and-play. Once you plug it into your network via Ethernet and plug it into an AC outlet, you’re ready to set it up. Using the eufy Security app, configuring the base station and syncing the cameras was a snap. This part of the process took less than 5 minutes. A screenshot showing a face in the notification. Very useful feature. I’ve been extremely impressed with the performance of the eufyCam security system. The picture quality is great and the viewing angle is wide enough to be confident you’re capturing everything you want to see. The motion sensor works very well and the sensitivity level is adjustable to suit your needs. You’re able to communicate in real time through your smartphone via the camera’s speaker and microphone. The cameras even have anti-theft detection that will sound an alarm if the camera is moved. The notifications are great and you can instantly see what’s going on at your house when you’re not there. The picture of a face in your notification is a great touch that saves time if you recognize who it is. While I haven’t had the system long enough to be able to confirm the battery life, the batteries appear to still be more than 80% full and I’ve had them running for over 1 month. The only real complaint I have is the fact that the facial recognition/AI doesn’t seem to reduce the number of notifications or false alarms we get. Anker and eufy are also planning to release a “lite” version of the eufyCam, called eufyCam E in February 2019. It will be similar in features, however without the AI facial recognition. 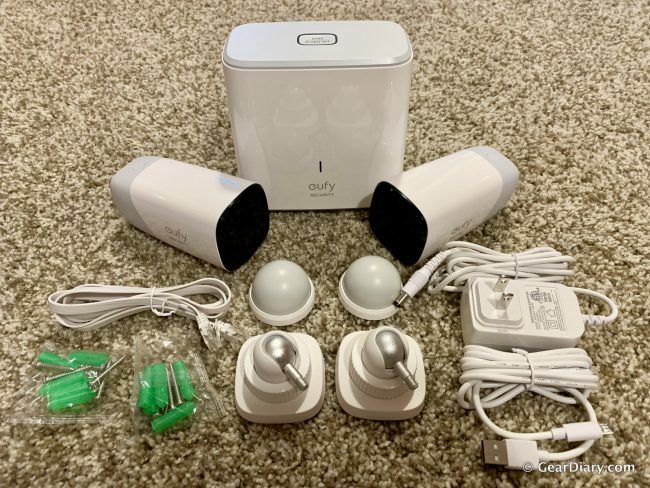 It will be available on Amazon and at eufylife.com priced at $449 for a set with 2 cameras. You can purchase the eufyCam 2-camera kit from Walmart, with a retail price of $499. The price is great when compared with other high-quality outdoor cameras since most others require additional recurring charges to access your recordings.